Monday nights are always late ones. I always do my weekly shopping after work and usually get home pretty late. That’s why Monday dinners must take 20 minutes or less, here start to finish. That usually means we’re having eggs in one form or another. I wish I would have made this a bit sooner as it would have made a lovely Easter brunch dish, but I’m sure you all have leftover eggs from the weekend that need some cooking. Leftover polenta, roasted asparagus, Manchego cheese and poached eggs are all neatly stacked for this simple meal. 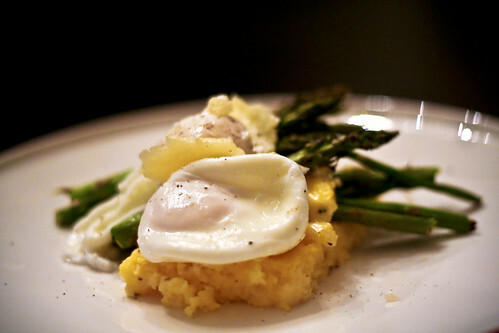 I love the play of textures between the coarse polenta, crisp asparagus and rich egg yolk. While you could certainly use the polenta that comes in a tube if you’re pressed for time, real slow-cooked and coarse polenta is healthier and more interesting if you’ve got the time. I would also encourage you to experiment with the ingredients. I’m a firm believer that everything tastes better with an egg on top, so switch the asparagus for watercress, ham or sausage – whatever’s in your fridge will probably taste amazing topped by an egg. Begin by making the polenta, as it needs about 20 – 30 minutes to cook and 10 minutes to set. If you’re feeling impatient, you can skip the setting time altogether and serve the polenta creamy. You’ll be better off serving it in a small bowl and skipping the “stacking” described below if you go this route. Bring the water to a boil in a medium saucepan. Once it reaches a rolling boil, add the polenta and reduce the heat to low, cover and stir every few minutes to avoid clumping and sticking. Let the polenta simmer for 25 – 30 minutes, or until it becomes very thick. When it’s done, spread it out in a shallow baking dish (8″ x 8″ works well) and let it cool for about 10 minutes. Once it’s cooled, slice it into 4″ squares, the way you would a pan of brownies. While the polenta is cooling, roast the asparagus. Turn on your oven’s broiler then line a cookie sheet with foil. Toss the asparagus with the olive oil, salt and pepper and place under the broiler for 10 – 15 minutes, or until the tips begin to brown a bit. They’re done when they’re slightly crunchy, but still firm. Poach the eggs while the asparagus is roasting. * Finally, assemble each dish by layering a piece of polenta, 1/4 of the asparagus, another piece of polenta, another 1/4 of the asparagus, 1/2 the Manchego cheese and top with the 2 poached eggs. Finish the plate off by grinding some fresh pepper over it. Makes 2 generous servings or 4 smaller servings. Fill a wide-mouthed saucepan with 3-4 inches of water and bring to a simmer. You are going to use this to poach the eggs one at a time. Gently crack egg into a ramekin, carefully slip it into a mesh strainer over your sink – some of the whites will run through and strain off (if the mesh is too fine, you wonâ€™t get the desired effect). This minimizes the fly-away whites you normally get. Now, carefully slide the egg back into the ramekin. Lower the ramekin down into the simmering water and let the egg slip out. Let it simmer there for a few minutes, past the point when the whites have become opaque. If you like a loose yolk, cook for less time. Remove the egg with a strainer or slotted spoon. I love the way eggs are so versatile, you can dress them up or down for any occasion. Poached is one of my all time favourite ways to eat them, perfect! I agree! I eat them at least once a week – a different preparation every time – and they’re always tasty and satisfying. i adore egg and polenta together. add a little fontina and truffles and i’m in heaven! looks beautiful. beautiful photographs!